Evolutionary biologist Gordon Orians and I are working on a project to investigate the origins and evolution of the human sense of fairness, and the role it plays in modern social, economic, and political institutions. I recently gave a talk on the subject. To begin the talk, I asked the audience members to recollect their first encounter with the concept of fairness. I had formed a fledgling hypothesis, and wanted to put it to the test. "I had to take the rap for something my sister actually did!" "My parents gave my brother a puppy, and I&apos;m the one who loved dogs. He didn&apos;t even like them." "I came from a family with nine siblings, and we had to fight each other for food." "I was an only child, and I really wanted a brother – all my friends had brothers." "I was foreign, and different, and all the other kids singled me out to pick on." Everyone—100 percent of an admittedly tiny sample—remembered their first encounter with fairness in its negative incarnation. My hypothesis is that this pattern holds, if not universally, at least in a very high percentage of individuals. We apparently begin with fairness as our default position. We&apos;re surprised and affronted when we first face a situation that seems unfair, so that&apos;s what we remember. It seems we&apos;re predisposed to prefer and expect fairness. Archaeologist Brian Hayden has a theory of how inequality first developed in human society. He thinks it grew out of the natural variability in human personality traits, among which are inclinations to be greedy or to share. In the first article in our series at Pacific Standard, The Evolution of Fairness, we explored Brian&apos;s work. 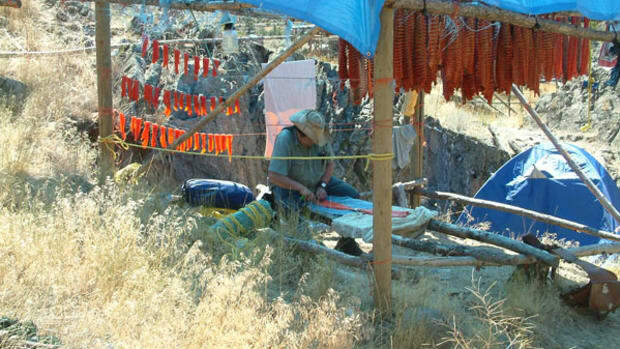 He excavated an ancient settlement in British Columbia near Keatley Creek and uncovered evidence indicating that two distinct classes lived within large pit houses that sheltered several families under one roof. This inequality had evolved sometime after their ancestors—who lived in an essentially classless society—settled in the village. Brian wanted to understand why. Their ancestors had lived a nomadic life. Among such traditional hunter-gatherers, who faced conditions of repeated scarcity, the norms of fairness were egalitarian. Sharing and cooperation increases the chances of success for the group as a whole. Uncooperative behavior, particularly greediness and cheating, was severely punished. According to Brian&apos;s theory, what changed this situation for the people of Keatley Creek was their ability to generate a surplus that could be monopolized. When they first came into the Fraser Canyon, they found an abundance of migrating salmon that were easily caught from rocks below the rapids. The fatty fillets were readily preserved by warm winds during the fishing season, and could be dried and stored as a rich source of food to get them through the winter. This reliable and storable surplus, he thinks, began to transform their society for two key reasons. First, the high-quality fishing sites and the dried salmon could be controlled by specific individuals. Second, this wealth could be passed along to their children. Even among egalitarian hunter-gatherers, some individuals are greedier than others—but so long as there was periodic scarcity and surpluses could not be co-opted by them, the community norms of fairness suppressed their ambitions. However, when there was more than enough food for everyone—as was apparently the case at Keatley Creek—there was less incentive to rein in greedy behavior. Ambitious individuals—Brian calls them aggrandizers—began to devise socioeconomic schemes such as bride prices and competitive feasting to garner an even greater share of the surplus. The aggrandizers used patronage to assemble support groups, which eventually led to a system of cronyism and the two separate classes Brian found in the pit house. He describes how this worked in the section Seeing Fairness Evolve. The process enabled the wealthy and well-connected to re-define the norms of fairness in their society—allowing for private property, political power, and the intergenerational transfer of economic wealth. It&apos;s the same process by which power has been consolidated throughout human history. We conclude the article by asking how these norms will be defined in the 21st century, as this will have profound consequences for the future of humanity and the rest of the species on earth. Given the role of variability in the evolution of fairness, we thought it would be instructive to investigate at what age variability in the sense of fairness develops in children. To pursue this line of the investigation, we went to the Early Childhood Cognition Lab at the University of Washington. Jessica Sommerville, principal investigator at the lab, and Marco Schmidt, currently at the Max Planck Institute for Evolutionary Anthropology, had collaborated on a research project that looked at the emergence of prosocial behavioral traits in infants at the age of 15 months. They performed two experiments with their sample group—one that measured their sensitivity to fairness, and another that looked at their preferences for sharing. Might any innate influence on the sense of fairness be evident in this early stage of the developmental process? Previous experiments had measured the emergence of sharing behavior in children. In 2008, researchers Ernst Fehr, Helen Bernhard, and Bettina Rockenbach published a paper in Nature called Egalitarianism in Young Children. They created a set of tasks where the subjects—children between the ages of 3 and 8—had to decide to share or not share candy with an imagined partner. While most children behave selfishly at age 3, the researchers found, as youngsters progress to age 8, many more "prefer resource allocations that remove advantageous or disadvantageous inequality." Only one of their tasks involved altruistic sharing—in other words, if the subjects wanted to make the resource allocation equal, they had to reduce their own supply. In the other tasks, they could make it equal at no cost to themselves. At all ages, the altruistic sharing task elicited the least generous behavior. In all the tasks, sharing behavior rose steadily with age. The University of Washington researchers thought that, by their very design, these sharing experiments could not have detected aspects of fairness that might be evident at an earlier age. They wanted to explore a quality called third-party fairness. Their paper cites "work suggesting that evaluating interactions between other individuals along the dimension of fairness (third-party fairness) is distinct from being the victim or agent (egocentric fairness) of unfair behavior." They wanted to see if they might detect a sense of third-party fairness at 15 months of age. But how, in subjects that can&apos;t yet talk or follow verbal instructions? Their experiment employed a phenomenon known as “violation of expectancy.” It relies on the observation that infants will look longer at something that surprises them than at something they already expected to see. Violation of expectancy, or VOE, takes advantage of a natural behavioral trait—not just in infants, but in adults and animals as well. Imagine that you’re walking along, and you hear an airplane overhead. You look up, and see that the airplane is flying upside down. Would you look longer at that than if it was flying normally? As an experimental technique with infants, VOE has proven to be a robust measure of an infant’s expectations, and how long they look is a reliable measure of VOE. In many different experimental settings, infants look longer when they perceive a mismatch between an outcome and the events that led up to it. Think of a magician pulling a rabbit from a hat; we’re surprised only because he’s shown us the empty hat before he did it. In their violation of expectancy test, the third-party situation was set up so the infants were passive observers of scenarios that demonstrated fair (equal) versus unfair (unequal) divisions of goods—either crackers or milk. Their reactions were measured in terms of how long they looked at each outcome. The infant was seated in a parent&apos;s lap, but the parents were instructed to look down and remain silent during the experiment, so they wouldn&apos;t communicate their own reactions to the children. A series of scenarios played out on the video screen as the infants&apos; reactions were recorded. In the video below, Jessica shows Gordon how the trials were run, including the control conditions that indicated they were indeed observing the infant&apos;s sense of fairness. The key control was the scenario that played out with no recipients at the table. When there were recipients—when it was clear that real people were being treated in a fair or unfair way—the infants looked at the unfair outcome an average of 50 percent longer than the fair outcome. When the situation was depersonalized, and the infants saw only plates or glasses with crackers or milk, they looked at the outcomes for roughly the same amount of time. The experimenters took this as a strong indication that when evaluating third-party fairness, infants expect an equal distribution of goods. "At the proximate level, biologists and social scientists have identified other-regarding preferences—such as fairness based on egalitarian motives, and altruism—as likely candidates for fostering large-scale cooperation. A critical question concerns the ontogenetic origins of these constituents of cooperative behavior, as well as whether they emerge independently or in an interrelated fashion." Like the sense of fairness, altruistic behavior is not easy to study in infants this young. In this experiment, they first established the infants&apos; preference for one of two toys; they then put both toys in the infants’ hands. Then a stranger would ask them to share one. In the next video, Jessica shows Gordon how the experiment worked, and explains the results. Their most intriguing insight emerged from a comparison of these complementary perspectives. It was interesting—as Gordon observed at the end of the video—that there was such a close correlation in the infants&apos; performance on the fairness and altruism tests. Roughly one-quarter of the subjects exhibited strong preferences for both altruism and fairness. Moreover, as Jessica put it, "How quickly they shared their preferred toy is related to their looking time performance." In other words, the most altruistic were also the most surprised by the unfair distribution of goods. What could explain the variability in their reactions at so young an age? Environmental influences, such as parenting style and sibling interaction, undoubtedly have begun to shape behavior by 15 months, so these experiments don&apos;t provide any direct evidence regarding the biological underpinnings of fairness, or the variability of its expression in individuals. Nevertheless, the experimental results invite speculation about the roots of the behavior, and how scientists might investigate them, so Gordon asked Jessica about her thoughts regarding the sources of the variability they observed. Jessica&apos;s speculation is intriguing. Could a combination of more and less fair-minded individuals somehow balance, as she suggests, the interests of society with the interests of the individual? Does this balance emerge from the tension between our drive for individual fitness and our need to function within our social environment? If so, then the first underlies our competitive instincts, and the second our cooperative ones. In terms of their altruistic/selfish predispostions, people doubtless fall on a continuum. Perhaps, from the days of the first surplus, aggrandizers have been steadily ratcheting the game up a notch, in an evolutionary sense. Could their economic and political dominance exert new selective pressures on the more fair-minded types, rewarding those individuals who respond by becoming more creative and entrepreneurial, and punishing those who don&apos;t? One can imagine such a process spurring the technological advances, economic development, and political dramas that have unfolded over the last 10,000 years. In any case, it seems remarkable that a sense of fairness and altruism should be evident so early in life, with such clear variability in its expression. The experiments performed by Ernst Fehr and colleagues demonstrated that a sense of fairness emerges as children become integrated into a social milieu. Jessica’s experiments suggest that some of us may have a predisposition to develop a strong sense of fairness more easily. Our multimedia presentation on the evolution of fairness continues with an explanation of how those with more convince those with less that their culture remains fair. Our multimedia presentation on the evolution of fairness continues as archaeologist Brian Hayden settles on an 'aggrandizing' theory for the shift in how we define egalitarianism. Our multimedia presentation on the evolution of fairness continues with an examination conspicuous consumption among primitive peoples. Our multimedia presentation on the evolution of fairness continues with a look at the classic mantra of real estate: location, location, location.